This blunt message recently came from Gavril Balint, one of Steaua Bucharest’s club legends. Balint contributed to the greatest era of Romanian football, converting a penalty in the European Cup final in 1986 against the might of Barcelona in Spain at the Ramón Sánchez Pizjuán stadium in Seville. At the time, although the Catalans were clear favourites, legendary goalkeeper Helmuth Duckadam had the game of his life, managing to save all four penalties, in the process becoming the first Romanian to enter the Guinness Book of Records and helping Steaua to become the first team from the former Eastern Bloc to win the European Cup. It was 1986 and football was still something for the romantics. The European Cup was being won by smaller clubs across the continent, including Aston Villa, Hamburg, Porto, PSV and later Red Star Belgrade. A manager such as Brian Clough could still take a team from the depths of despair and turn it into a European champion twice in a row. Steaua Bucharest could still do this with local talent picked up only within the confines of Romania. I have read somewhere that “when everyone is obsolete, nobody is actually obsolete”. True words. At the beginning of the 1990s, the winds of change were starting to blow and the bright minds from England and UEFA decided that the First Division should become the Premier League and the European Cup should become the Champions League. It was a revolution that was developed during the ’90s, a transitional period between the romantic era of football and the modern era. The gap between Romanian football and the modern game became impossible to bridge after this seismic shift. In December 1989, the people of Romania also witnessed major change. The nation’s communist president, Nicolae Ceaușescu, was shot on Christmas Day and the Romanian Revolution led the country towards capitalism and a free, open market. Footballers saw a chance to leave their homeland and experience the cultural, and monetary, benefits of playing abroad. Gheorghe Hagi moved to Real Madrid for $4.3 million which, until Vlad Chiricheș’ move to Spurs in 2013, was the record fee for the national championship. Club icon Marius Lăcătuș went to Fiorentina, Chelsea’s future right-back Dan Petrescu went to FC Foggia, Romania’s national team goalkeeper Silviu Lung moved to Logrones, team captain “Fane” Iovan moved to Brighton and gifted midfielder Tudorel Stoica went to Lens. The exodus was virtually endless. A decline was impossible to avoid after all these losses and three years followed in which Steaua won a solitary national cup in 1992. However, a swift recovery followed and the club managed an impressive six consecutive championships between 1993 and ‘98. In ‘98, nine years after the fall of Ceaușescu’s communist regime, Steaua Bucharest was taken over by a group of private investors, who received approval from the Defence Ministry to obtain the brand. 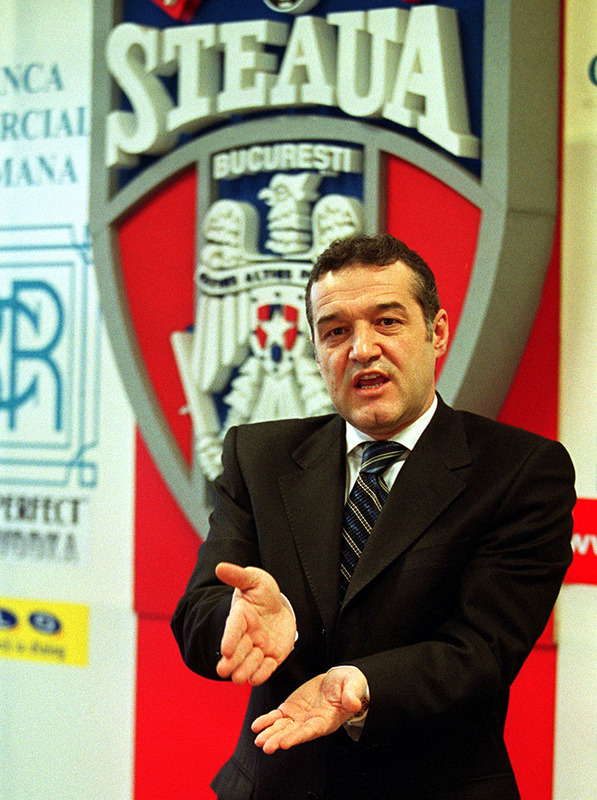 Things changed, however, when George ‘Gigi’ Becali took over the football club in 2003. No one knows exactly what happened but after a couple of mysterious negotiations with the Defence Ministry, the club transferred into the hands of Viorel Păunescu. He struggled as the club’s president and it didn’t take long until Steaua were driven into debt. Despite winning the title in 2001, when the team was managed by former national coach Victor Piturcă, Gigi Becali, a former real estate mogul turned Member of Parliament, was offered a role in the club in hope that he would invest money in the beleaguered giants. Becali instantly embraced the idea and the next year he eventually purchased over 50 percentof the football club’s shares, turning them into a Public Limited Company. Becali later purchased another 14 percent of the club’s shares and ensured that everything moved in the same direction in order for him to become the legal owner of the Steaua Bucharest. Nowadays, Becali doesn’t have any official links to the club as he “gifted” all his shares to friends and peers. However, it remains the worst kept secret in Romanian football that he still has majority rule at the club and his word is final. His initial plans for the development of the club were promising. Becali no longer wanted to sell his best players at the first major transfer offer received from Western Europe and planned to build a solid team based on home-grown players. The start was promising but the insatiable passion he had for TV appearances, combined with his insane pleasure for putting on a show in front of the cameras – not to mention his decision to enter the political fray and run for president – all changed Becali, his decision-making and the public’s perception. Famous footage of Becali posing on his Maybach with the sheep he had in the backyard of his house, of ordering tactical instructions to his staff during matches, fighting a newspaper reporter and calling him “liar”, and having drinks with country’s president all quickly turned Gigi into a celebrity. 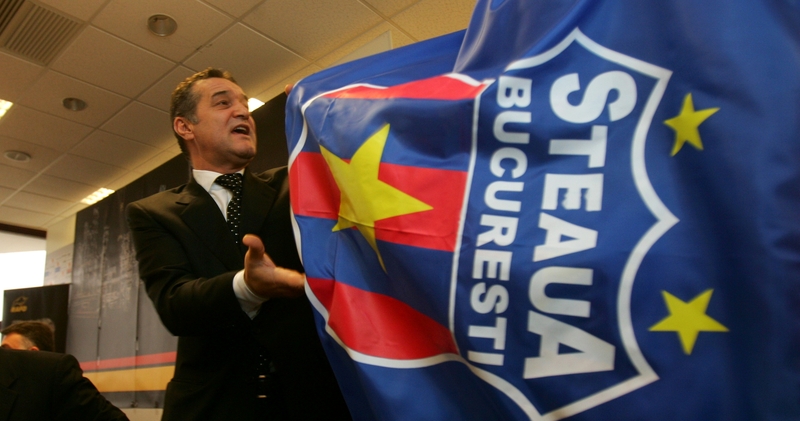 Little by little, Becali was losing his mind and Steaua was starting to stagnate. During the last decade the club has quickly turned from one long-term strategy to another and has witnessed over 14 managers, including Romania’s all-time legend and Becali’s godson, Gheorghe Hagi. Initially the millionaire wanted to keep the club’s most valuable players, following the same plan as the one from the 1980s. He then changed his mind – on a whim, it should be said – and focused on buying promising foreigners, not hesitating to pay €2 million for one of the hottest talents from South America at the time, Dayro Moreno. “He has class, he’s the only player with class in Romania,” Becali said. Cristiano Bergodi, the team’s coach in 2009, was sacked soon after, and in just a few months the ‘Arsenal of Romania’ project ended. The global financial crisis then started to affect Becali who began to focus more and more on politics, while Steaua failed to win a single trophy for three years during which they grabbed only out-of-contract, largely unknown players, with an imposed wage ceiling of just €10,000 per month. However, in 2012, light started to appear at the end of the tunnel. The club began to take advantage of the severe financial problems of their main rivals and made a few marquee signings, picking up the cream of the crop who were playing in Romania’s Liga 1 at that time. Results improved as a result: two consecutive titles, a Super Cup and qualification to the group stage of the Champions League. Unsurprisingly, it was only a matter of time before Becali’s influence would wield its sorry hand and destroy any palpable progress made. In 2014, Becali was arrested and sent to prison for three years. The same fate fell upon the club’s executive director, Mihai Stoica. Consequently Roș-Albaștrii had to be managed from behind the bars. While the club’s leaders were in prison, Steaua were stripped of their name, colours and emblem after losing the fight over their trademark with the country’s Defence Ministry. In essence, the verdict of the court left the most important club in Romanian football as one with no name. It was tragic to see the club appear as ‘Hosts’ on the scoreboard at the home game in December 2014 against CSMS Iași. The club’s logo was also removed from the scoreboard and the players’ shirts, replaced by a black square instead. Furthermore, the name Steaua was never mentioned by the announcer in the stadium. “I really cannot understand why the government wants to ruin the football team.” These words belong to Sandu Mircea, UEFA executive committee member and former president of the Romanian football federation. This decision had a telling impact on the fans. Some of them have abandoned the club, no longer able to associate themselves with Becali’s controversial regime, while others have protested against the lack of reaction from the club’s owner and management. Steaua Bucharest is Romania’s most popular and successful club having won 26 league titles, 22 national cups and six Super Cups. A study conducted a few years ago concluded that almost 60 percent of Romanians proclaim Steaua as their favourite football team – a remarkable, resounding number. Gigi Becali, however, does not seem to care. “Steaua’s squad from today is the strongest Steaua team since the Revolution.” Sadly nobody is taking him, or his idle words, seriously anymore. The sad truth is that Steaua was knocked out of the Champions League qualifying round by Partizan Belgrade and eliminated in the Europa League by Rosenborg. With Gigi Becali at the helm, the club’s controversial owner, dubbed by some as the worst in Europe, the tumultuous ride which threatens the very existence of this historic club looks set to continue.